Review: We have all heard about fairies, dwarves, and elves at least once when we were little. We thought that fairies were beautiful, cheery, creatures. But if you think that fairies, dwarves, and goblins are really like that, then you need a lesson from the fairy expert Miss Edythe McFate. The wise, Miss Edythe McFate, is created by the author, Lesley M. M. Blume. Miss McFate narrates Modern Fairies, Dwarves, Goblins & Other Nasties written by Lesley M. M. Blume and is the person to go to for any fairy situation. She has the most vast knowledge of fairies anyone can ever have. Modern Fairies, Dwarves, Goblins & Other Nasties is not just one big story; it is made up of lots of little stories that somehow come together into a masterpiece. Miss Edythe McFate shares her knowledge of mythical creatures showing up in human lives and shaking things up. For example, she uses a story called "The War at the Algonquin Hotel," to show how fairies show up in human lives. In most of the stories, Miss McFate explains how some people can see fairies with "fairy sight" and how some people can not. She is almost like a librarian who knows about fairies and how they live and work. She knows about dwarves and their underground homes. She even knows about mermaids, (which according to her are really fairies). These fairies have their own stereotypical stories. In the beginning, Miss McFate explains that all fairies are not dancing, sugar plum fairies, and dwarves are not all whistling as they go to work. They are really dark, scary creatures. Modern Fairies, Dwarves, Goblins & Other Nasties is a great read for people who believe in or have an interest in mythical creatures. Their actions may surprise you, but also seem logical in many ways. I love the illustrations in the book. The pictures are really not what you would expect fairies, goblins and dwarves to look like. Miss McFate makes fairies and other creatures look almost evil, yet gentle and sweet at the same time. The author of Modern Fairies, Dwarves, Goblins & Other Nasties does a wonderful job explaining and giving examples of experiences with fairies. It is very hard to give examples about experiences that might not be real. I think that this book is somewhat humorous, but mostly serious. It requires your imagination in order to fully understand or enjoy the stories. I, personally, think that best parts of the book are the stories that explain how fairies show up in peoples' lives. This book is a great read for anyone who wants to learn about fairies or anyone who has a curious mind and imagination. We would like to thank Random House for providing a copy of Modern Fairies, Dwarves, Goblins & Other Nasties: A Practical Guide by Miss Edythe McFate for this review. 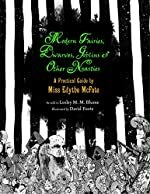 Have you read Modern Fairies, Dwarves, Goblins & Other Nasties: A Practical Guide by Miss Edythe McFate? How would you rate it?